Your school needs to be featured in our new Schools Guide. Do you have an open house for new families? A kindergarten round up happening this spring? Do you accept new students year round? Do you have openings? Staying top of mind with area parents over the long haul can be a challenge. Our goal is to make it affordable, convenient and effective to keep your school and all that you offer in front of KC metro parents year round. Get your school or preschool into our comprehensive Schools Guide for Kansas City and surrounding areas. We just launched an option that allows your school to be featured for only $199 for 12 full months. iFamilyKC is officially #1 in engagement with KC metro parents; after over 15 years of service, parents trust us and look to us for resources for their families. Just fill out this FORM, then email it to us so we can help you get started. Your page with all of your events and offerings can be up on our site within 2 business days. Make sure parents find you. Not only do you get your own page on our iFamilyKC.com web site, but we also will be compiling a blog article that lists and links to every school page. That article will be promoted in our eNews blasts to over 22K local families throughout the year, and we will be sharing the same info on our iFamilyKC Facebook page with over 100K followers, plus promoting on our iFamilyKC Instagram, Twitter and Pinterest too. 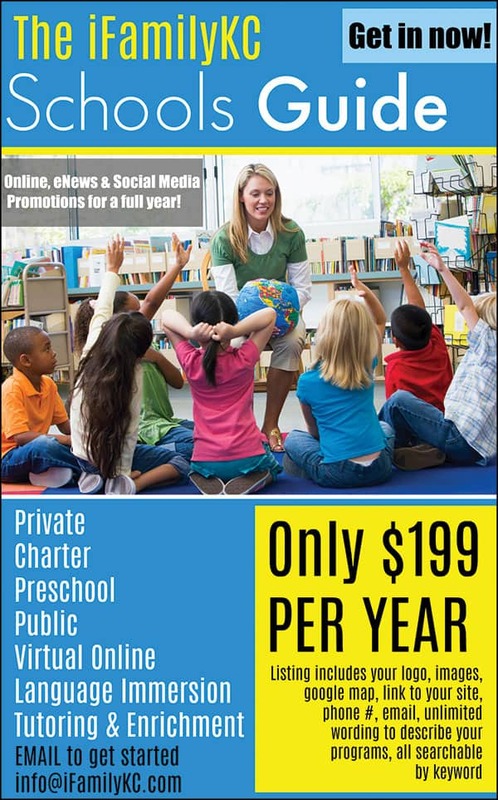 The low annual fee allows your school to be promoted with links from our web site, on our social media and in our emails. All of this helps with SEO so parents will find your info beyond what you put out on your web site. We also offer a separate option for a Facebook Live Video Show done by our team at your location for $275. This Live Show on our iFamilyKC Facebook page consists of a tour and Q&A with someone from your team to highlight of all that you provide for students, families and parents. We do a paid boost of the video to reach and engage with area parents. Call today with any questions or to let us know you’d like to be included, 913-744-1400. Parents look to iFamilyKC for quality resources for their kids. Make sure parents find you.